Post Tagged with: "world ip day"
Today is World IP Day, which marks the creation of the World Intellectual Property Organization. 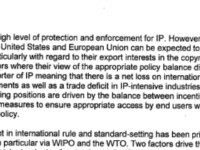 Canadian policy has long preferred the use of international bodies like WIPO to advance its IP objectives, yet the intellectual property provisions in recently concluded trade deals such as the TPP and CETA run counter to Canadian strategy. That isn’t just the opinion of the many critics of those agreements. It is what government officials told International Trade Minister Chrystia Freeland as part of her briefing materials. Canada’s preferred strategy is to establish international IP rules through multilateral forums such as the World Intellectual Property Organization (WIPO) and the World Trade Organization (WTO). However, in the context of the Canada-EU Comprehensive Economic Trade Agreement (CETA) and the Trans-Pacific Partnership (TPP), Canada negotiated trade obligations that, while reflective of recent domestic reforms, are beyond those standards set through multilateral forums, and which will likely require amendments to domestic practice, such as in the areas of geographical indications (GIs) and patent protection for pharmaceuticals.